This large painting (84”x90”) was first exhibited publicly on March 2, 1914. Picasso, at age twenty-four, painted it in 1905. André Level , a young shipping magnate, bought it from the artist in 1908. That doesn’t sound extraordinary until you look at Level’s motivation. 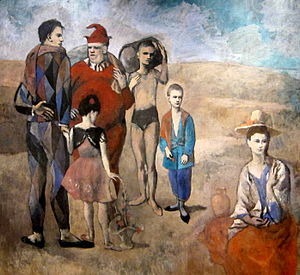 Level was so successful in his business that he could take the afternoon off to study art and the happenings in the Parisian galleries of Weil, Vollard and Bernheim, who showed this strange new art that didn’t look pleasant and was called “avant-guard.” To us now, Picasso’s “The Family of Saltimbanques” looks mild, even pretty. We can tell what’s what and that’s not what later art gave us. But to the starched-collared folk of the early 1900’s this painting looked crude, impolite and threatening to civilization as they knew it. Why did Level buy the Picasso? Level started buying the new art on speculation in 1904. With twelve other investors, he formed a consortium that put him in charge of making the aesthetic decision. 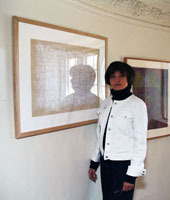 They gave him the money, he went around buying up art from galleries and directly from artists like Picasso and Matisse. Speculating that this art was the next big thing, he stored it in a warehouse for ten years. Then on March 2, 1914, Level held an auction at a Paris hotel in which he presented 145 lots. Level’s investment paid off handsomely. The auction sales brought in four times the money originally invested. Among the paintings were ten Matisses and a dozen Picassos. The Saltimbanques, the highest priced work on the block that day, fetched twelve times what Level had paid Picasso for it in 1908. We’re now observing the 100th anniversary of the auction that focused attention on the relationship of commercial and aesthetic judgments. The auction was called “Le Peau de L’Ours,” the skin of the bear. The name comes from La Fontaine’s fable, “The Bear and the Two Companions,” in which two friends in need of money sell the skin of a bear to a furrier before they have gone to the trouble of trapping the animal. The “future contract” goes unfulfilled because the bear not only proves indomitable but even subdues one of the hunters so that he can whisper in his ear, “don’t sell the bear’s skin before you’ve sacked him.” By analogy, the paintings bought on speculation are like the skin of the bear. After the spectacular profit made at the Le Peau de L’Ours sale, avant- guard art appeared to be as good as gold. To learn more about the creation of the market for twentieth-century art, see “Making Modernism” by Michael C. FitzGerald. 1995, 268 p. The author holds a PhD in Art History and a MBA and he writes well.